← What can I do with my router – part 2? I thought I’d touch on some basic set-up information and maybe some more useful feature setup info. Routers vary so I might talk about some things your router doesn’t have or maybe uses different terminology. Your router may have some features I don’t mention. Most routers have set-up wizards or make it easy for you to get connected to the internet even if you don’t know what it all means and if that’s as far as you want to go then fine but if you are a bit more curious then read on dear reader. Let’s get straight into the acronyms! This will be one of the first configuration choices when you want to connect to the internet manually. In this country PPPOA is the common choice and may be the default, it stands for “Point to Point Protocol over ATM”. PPPOE is over Ethernet instead of ATM. In English it is simply the way that your router is going to connect to your provider so you can access the internet. It handles your login details and holds up your’ connection. ATM stands for “Asynchronous Transfer Mode” (and I’ll thank you to stop yawning) which is the way information is switched or if you like traverses the “internet / network”. PPPOA uses your login user name and password to authenticate your connection. PAP – “Password Authentication Protocol”, CHAP – “Challenge Handshake Authentication Protocol”. These are two methods of handling the authentication process. CHAP is the more secure. Your router may be able to work this out for itself and you may be able to choose “PAP or CHAP” as a setting. Usually have the value of 0 and 38 respectively. VPI is for “Virtual Path Identifier” and VCI is for “Virtual Channel Identifier”. Different countries have different combinations of values, 0/38 is the UK combination and this identifies the next destination point for your data to go to, initially the BT network. VC-MUX stands for “Virtual Circuit Multiplexing“. This is a method of controlling how little bits of data (called packets) get around. LLC or “Logical Link Control” and SNAP or “Sub-network Access Protocol” are other methods that may be used. VC-MUX is common in the UK. I’ll leave it there otherwise we will have to enter techy hell analogous to taking a clockwork watch apart and trying to put it back together again. Er, um, this is old school stuff. This is the way a frequency is used to transmit and receive information. There are several ways of doing this for example if a frequency is changed between 1000hz and 1001hz then 1000hz can be used to signify a “0” and 1001hz can be used to signify a “1” and so, an analogue signal can be used digitally. 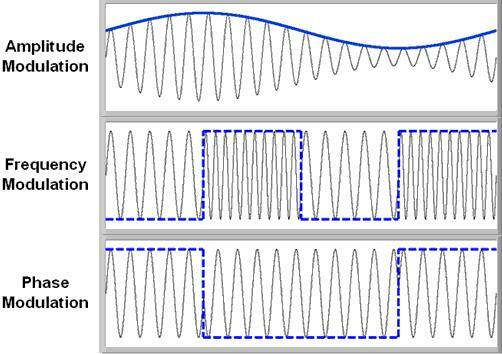 Changing the strength (amplitude) of the signal or staggering it (phase) are other ways. Anyway, different types of broadband use different regimes so you can either choose the appropriate modulation by broadband type such as “ADSL2+”, “ADSL2+ Annex M” or set it to “Multimode” so that the router can work it out for itself. There are times when the router may have trouble doing this in which case you may need to pick the correct setting manually. If given the option and you want your broadband to remain connected continuously then tick “always on” (this is sometimes referred to as “Nailed Up”). If you don’t want the connection to disconnect if it’s not used for a while then set the “Idle Timeout” to -1. Well folks, there is an answer … “Load Balancing” and “Failover”. 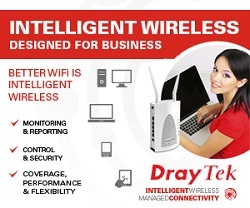 Certain routers can accommodate this such as the Draytek Vigor 2830 or 2850 series or the Billion BiPAC 6200 NXL. 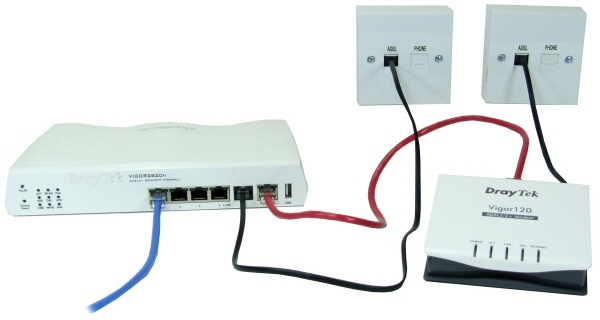 These routers can take a second broadband supply and balance the 2 supplies to give you more capacity. If one supply fails the other will continue to work. You will need an inexpensive broadband modem such as the Draytek Vigor 120 for the second connection and you will probably want the broadband supplied by two different suppliers who use two different networks as if one ISP has problems hopefully the second will keep on working. Ok, so what happens if a digger working in the street cuts all my telecommunication cables? Well, you can also plug a mobile broadband modem into a USB port in the router for failover only. This will only work if the signal is strong enough in your area / premises and it probably won’t be as fast your land line broadband but at least you can continue to function. Ok, so what happens if the router fails? Have a second router configured as a standby. If broadband is critical to your business then this is a very small price to pay for some assurance. You might want to protect your routers electricity supply by plugging it into a UPS (uninterruptable Power Supply). Well, I think that’s enough for now, how am I doing? Next time I’ll talk about some more basics and, now, let me see, hmmm, maybe wireless, Firewalls or VPN’s, not sure yet.